HTC Deluxe to be renamed for Europe? So what will it be called? 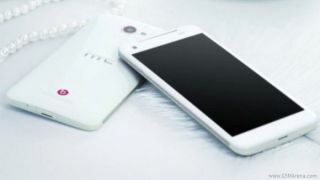 HTC has announced on its Facebook page that the HTC Deluxe won't come to Europe. Before everyone gets up in arms about the supposed cancellation though, it is most likely the handset will arrive on these shores, just under a different name. HTC was responding to a fan who posted a link to Friday's leak that saw pictures of the Deluxe in three colour variants. The response translates as: "the Deluxe unfortunately will not come to Europe." It's unusual for HTC to make an outright denial like this. Usually - like most companies - it would just say it doesn't comment on rumour or speculation. So maybe it wants us to know the handset definitely won't be called the Deluxe. The Deluxe looks like a real challenger to the Samsung Galaxy Note 2. It's slightly smaller than the Note 2, with a 5-inch screen, but will easily dwarf the likes of the iPhone 5. When the latest pictures leaked on Friday, we heard an official announcement was scheduled for December 6. So hopefully we should know for certain then. What do you think the Deluxe will be called? Let us know.